i had to go to immigration (so of course the mini-bus i hopped on dropped me at passport control instead) to get my passport stamped. you get a 3 month visa when you enter zambia, but have to get your passport stamped every 30 days for some unknown reason. it’s free, you just have to go to immigration and get your stamp and apply for your next 30 days. so, i finally found immigration (thankfully it was only a few blocks from passport control) and went up to a lovely looking lady (at this point i should mention looks can be deceiving) for my stamp. she opened my passport and promptly said “madam, you are here illegally. you will give a statement, admit to your offence, pay 1,080,000 kwacha ($400) or we will drive you straight from here to the airport and put you on a plane.” i promptly burst into uncontrollable tears. she said “madam compose yourself” which just made me cry harder! turns out the person at the airport when i arrived in zambia had randomly decided to only give me 14 days in the country (because the group i traveled with were all leaving after 14 days) and i didn’t check the stamp in my passport properly. i end up sitting in the holding room for over 7 hours with nothing to eat or drink. i cry for approximately 5 of the 7 hours and end up with a crying induced migraine like nothing i’ve ever experienced. i never get to tell my story to anyone at immigration who has any authority to help me. i was forced to pay the fine and then told i had to leave the country by air within 7 days. As i go to leave the holding room one of the immigration ‘workers’ says “katie, are you married?” “No” I reply. “I would very much like to marry and australian woman” he says. hmmm…as delighful as this 7 hours of ‘getting-to-know-you’ has been i think i will say “thanks, but no thanks”… truly the most horrific day of my life! so today i am sad. i have to leave a project that i love and was really only just getting started at. i will fly to zimbabwe and spend time at a baby orphanage and hopefully be able to have a few more weeks in zambia with chikumbuso at the end of november before flying to london. sorry it’s been a while between emails. have arrived back in zambia after 5 life-changing weeks in zimbabwe (the land of the slowest internet connection ever, hence no email til now)…and amazingly they let me back in the country without feeling the need to abuse me, fine me, make me cry or lock me up…for all of this i am truly thankful. my plane from zim was delayed for 6 hours so i had plenty of time to plan my assault on immigration were they to give me any trouble. the plan i came up with mostly just involved me crying and begging them to let me in…so probably good for all involved that i didn’t need to put said plan into action. aside from a few meals at friends places where i ate anything i saw in their kitchen, this is what i ate every day for 5 weeks…i was hungry…but then i think the whole country is pretty hungry at the moment so it was nice to fit in. in the last eight years the economy has inflated 1 000 000 000 000 000 000 000 times…i don’t know much about economy related issues, but this seems a little excessive right?! i have learnt lots of new numbers in zim. quadtrillion is a one with 15 zeros, it was going to cost me several quadtrillion zim dollars to fly from bulawayo to harare (45min flight). the maximum daily withdrawal from an atm at the moment is 500 000zim dollars…not enough to buy a loaf of bread. everywhere you go in town there are thousands of people lining up at atms to withdraw their daily limit and somehow try and figure out how to feed their family of 8…craziness. foreign currency is the only way most people are surviving. ie relatives outside the country send in rand or US$, otherwise it is literally impossible to survive. the government keeps randomly taking zeros off the money and issuing new currency which has left anyone with a savings account or pension plan with money in their account that is worth absolutely nothing…have i used the word crazy yet? 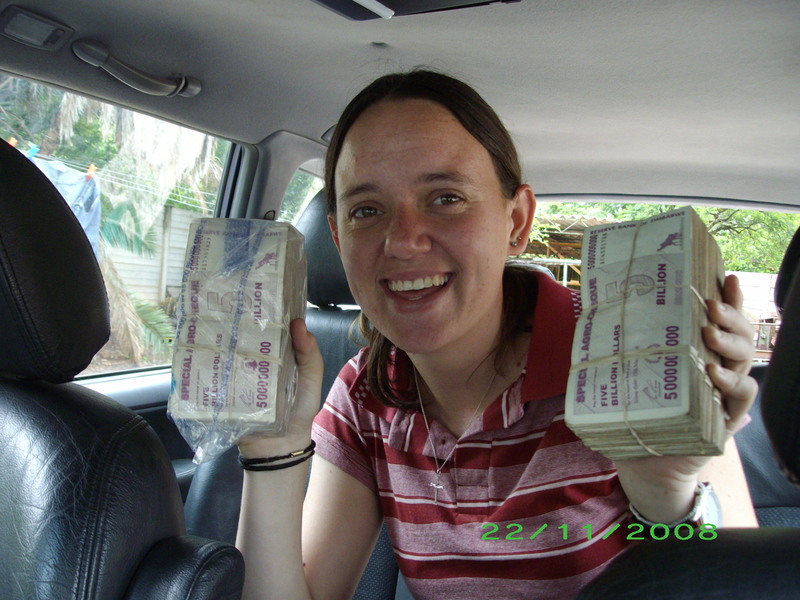 i have attached a photo of my friend tarryn with 2 bricks of old money (5 billion dollar notes). this money is now worthless since they’ve taken off 8 more zeros, but if it was current currency it would take 4000 of these bricks of money to buy a loaf of bread. i visited with an amazing project and did not want to leave!!!! the project started out as a home for abandoned babies. my first day at the babies home was terrifying. 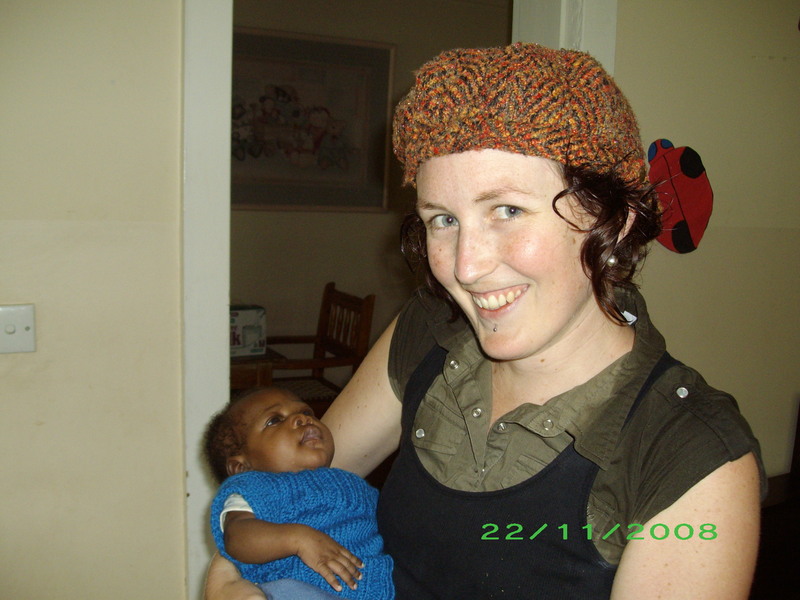 i was left in a room…by myself…with 8 children under the age of two (including 2 newborns)…yeah that was comfortable for a person with the world’s biggest baby phobia! i got kind of comfortable, but mostly spent the whole time praying that nobody would die on my shift. 2 of the attached photos are babies at the home. bridget (pink jumper – Clare can you show Norma the kids are wearing her jumpers) and daniel (blue jumper). daniel was a week old when i arrived. he was found at one day old in a ditch still attached to the placenta with dirt in his mouth, ears and nose. it is suspected that someone had tried to bury him alive. just one story amongst so many which i came across. the babies are precious to say the least:-) in the photos it appears as though i am sweating profusely as my shirt sleeves are soaking wet. just want you to know that we had just got caught in a big storm…i’m not a big sweaty bush pig. there are several other homes for older orphans which i visited too, and a home for street children. kids end up on the streets if they are orphaned or suffering abuse at home. there are children in this home as young as 7. this little girl had been living on the streets for over a year…how does a 6-year-old survive on the streets? i loved these kids and spent a lot of time singing with them, learning music from them, dancing with them and writing songs with them. i also worked 2 days a week at a soup kitchen where i became the resident cabbage expert. turns out i’m kind of awesome at cutting up and cooking massive quantities of cabbage. we served over 200 people each day. looking into the eyes of someone who is smelly, wearing rags and is starving to death is a hugely humbling experience. the people working on the ground are inspirational. a lot of them are only making US$15-20 per month…not enought to live on…but they live by faith and always end up with enough…this place has taught me a lot about God’s provision. I know that there is a lot more i could say…but this is getting too long. i hope you’ve got an idea of what zim is like. if you’re someone who prays, please pray for this nation. i have no idea how this place will be restored, it’s truly heartbreaking to see the effects of a corrupt and greedy government. be thankful today for your house, your meals, your hospitals, your families…and your soft toilet paper!!!! i am still working my way through my inbox and replying individually to emails. i didn’t get much of a chance at all to email in zim, so apologies to those who’ve been waiting to hear back from me for several weeks…it will happen…i promise! please write to me if you get a chance…hearing from home is always a massive treat! So, if you’re a person who prays… Don’t forget Zimbabwe. And give thanks for Katie, and people like her. People who just want to be a Christian.